The Gerber 24-inch E-Tool is a compact spade shovel designed to be durable and efficient. The blade is powder coated carbon steel with a serrated edge and a pick on the back for chopping through hard or frozen ground. It weighs just over 2 pounds and folds up to literally fit in the palm of your hand. 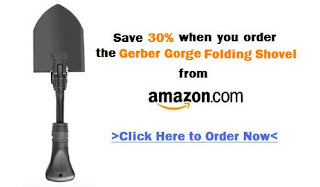 This product is manufactured by Gerber, a heavyweight in survival tools. It was originally priced at $75 now $41 making it one of the most affordable E-Tool's on the market.